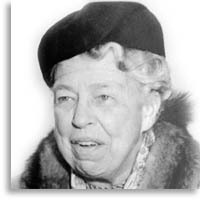 Eleanor Anna Roosevelt once stated the values which resonated throughout her life. "One fights for freedom in personal contacts and in many phases of civilian life. At all times, day by day, we have to continue fighting for freedom of religion, freedom of speech, and freedom from want, for all these things that must be gained in peace as well as in war." Eleanor, the niece of President Theodore Roosevelt, married her fifth cousin, Franklin Roosevelt, in 1905. In 1921, Franklin was stricken with polio. Whilst it was necessary to maintain his political interests, Eleanor wished to achieve her own goals of freedom and equality for all human beings. Therefore she participated in the League of Women Voters, joined the Women's Trade Union League, founded a non-profit furniture factory, taught in high schools and began her career as a speaker and writer. Franklin Roosevelt became President of the United States in 1933 but remained crippled by polio. Eleanor was "his eyes and ears", travelling extensively and advancing the causes for which he was fighting whilst remaining herself more radical in her advocacy of rights for women, children and the poor. Ridiculed and reviled by some for doing so, she urged tolerance and an understanding of ideals which, she later said; "carry no weight unless the people know them, unless the people understand them, unless the people demand that they be lived." After Franklin's death in 1945, President Truman appointed her to the USA Delegation to the United Nations General Assembly, a position she held until 1953. She was chairman of the Human Rights Commission during the drafting of the Universal Declaration of Human Rights. The negotiations were difficult and complex but she believed that; "The study of human rights, the acceptance of human rights and freedoms, may be one of the foundation stones in giving us an atmosphere in which we can all grow together towards a more peaceful world." Eleanor Roosevelt died in 1962. She was buried, as she wished, in a rose garden alongside her husband on their estate in New York.